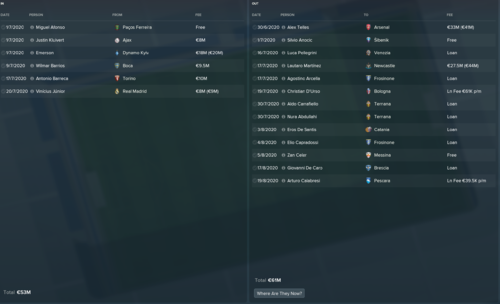 Just getting to the end of the first season transfer window, I have noticed that its really difficult to buy and sell players in Italy. 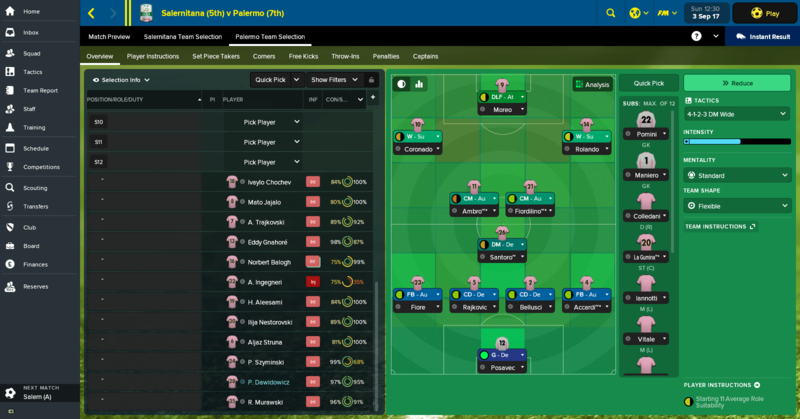 I have a bloated and over inflated squad of 30 players, but no one is interested in taking my players even for 0 fees. I only got some loan offers for a couple of them, with mandatory fees, but then the players rejected joining the club so the future transfer became optional. Pretty annoying. 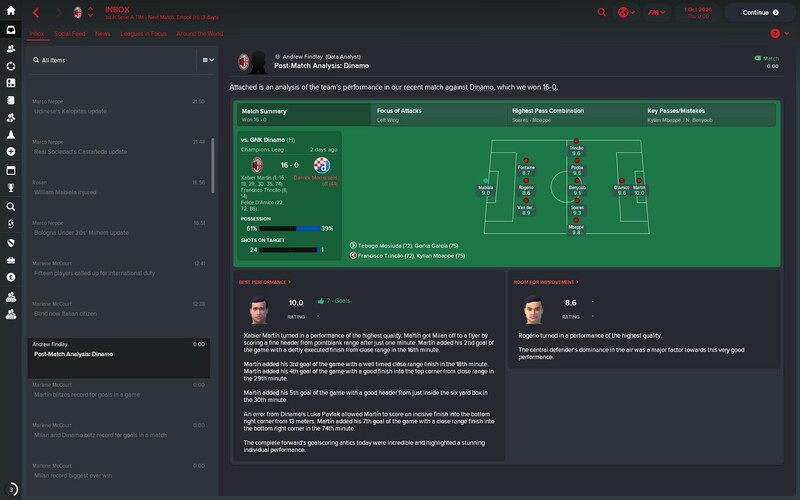 On the upside, I managed to get in Cutrone and Kishna both on loan with an option to buy. 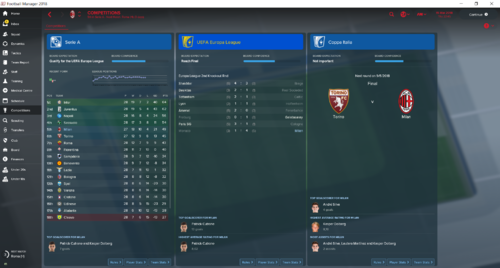 Have started the season with a 2-2 draw away to AS Roma and a 3-1 home win against Chievo. Lapadula has 4 goals in the first 2 games already. 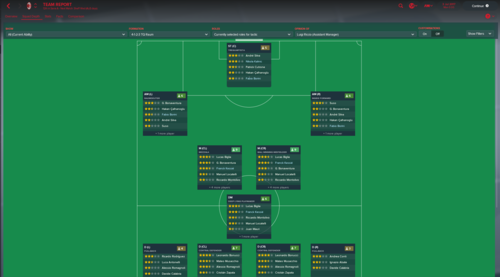 Also any tips on keeping my squad players fit, as there is no reserve league, can over-age players play for the U20 side? I still am stuck with a massive squad! Hope I will be able to find loan deals for some players in January. My DOF is pretty useless as well! Do you have a large database with a lot of leagues loaded? I've recently discovered that the consensus is a large database means too many players -> nobody wants them and even though their valuations for you may stay high, other teams aren't willing to spend as much. Also there's really no way of keeping squad players fit. If you have more than fit on your 12 man bench, I'd save a team selection which is your first choice XI plus 12 subs who you actually want, and try to rotate those subs in to keep them fit, whilst completely ignoring the ones you want out. If they get unhappy, it'll make them more willing to leave. Also any tips on keeping my squad players fit, as there is no reserve league, can over-age players play for the U20 side? Anyone else noticed you're getting much more yellow cards in italia then in other countries? Yes lots of yellow and also red cards! Started a new Juventus save to check out what I can get from their academy. Do you think it is good to keep current HOYD or go for Peters? Second question - looks like Buffon will be no longer with me from next season, anyone lucky to bring Donnarumma to other Serie A club? He looks insane in potential, out of curiosity I checked with GS and he is 200 PA (!!!). I can splash whatever budget I will get, as I plan to use current players and sign some bargains (like Marcos Llorente transfer listed). Playing 523 system and just need BWM and BBM in my system, so I would focus on keeper, defenders and strikers. BTW - how financials looks like in Serie A, considering I am aiming to be present oftenly in UCL final? I just qualified for the champions league with Genoa and have been given an initial transfer budget of a measly 7 million by the board! And guess what, I had 6.75m from my current season budget left. So that’s basically nothing. 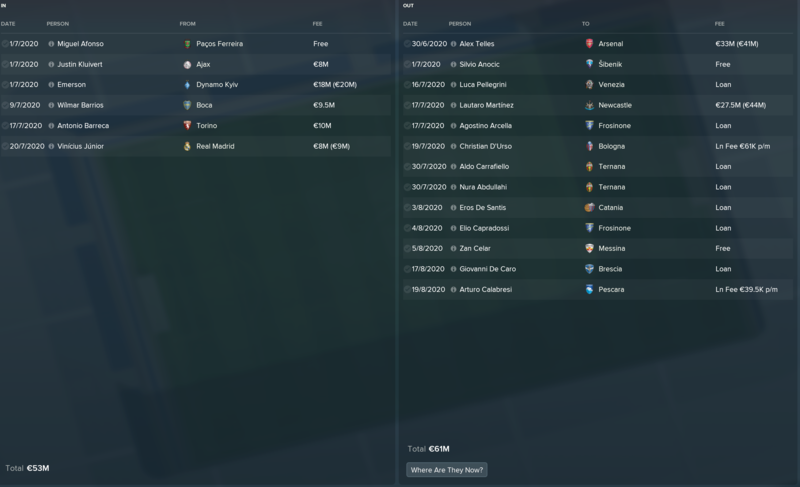 How is one supposed to build a squad in Italy with these kind of budgets?! I understand. So it might be challenging for smaller clubs. However - what are your turnovers? Genoa might not be the club which is global trademark and transfer budget is generally dependent on the turnovers etc. Looking for Juve turnovers, predicted for next year is around 460M EUR, and I am going to win whatever I can to have positive impact on it. So still this is nothing comparing to 860-900M EUR of Barca or Real. And this is exciting - apart from my Donnarumma wish - I would like to stick to Juve transfer philosophy and take some bargains. On the other hand, I would like to improve their youth system. 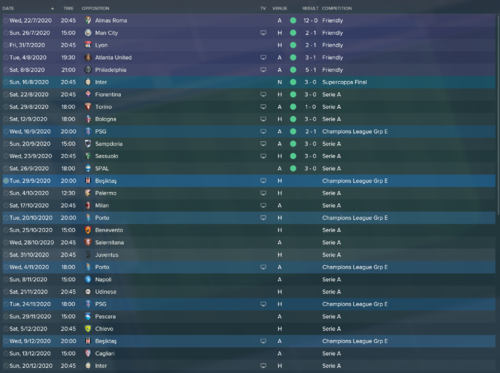 In meantime I am really enjoying Juve save so far. Sold Liechtensteiner, Asamoah - instead I bought Llorente from Real (1,7M), and Gaya (15M). We got some problems with two draws, and we went to bravely for Inter game and we went down 0:3 in first half. A bit worried about early big team in UCL but we will see what we can do. And this gem I got from intake. I feel next year he is ready for first team. Unfortunately he is unambitious so long tutoring in front of him. Looks very decent But I would leave him in U's19 for next season then promote him after? This does make sense as well. So far I am doing a lot of gymnastics to keep Higuain, Sandro and Dybala (who scored 50 in the league and got Ballon D'Or) in the team. Surely, having 11 players away on international duty should mean a postpone of the game? I'm in 2017, Serie B. Who is everyone managing at the minute? Anyone tried something with a summer transfer update? Would like to go Full-Italian Squad. in my fourth season with lazio . 2nd season and 3rd season won league and cup . I'll probably do one more career after at least the serie a and PL transfer windows will be closed (17 and 9 august). how many CL did you win? Have you a link to this tactic? 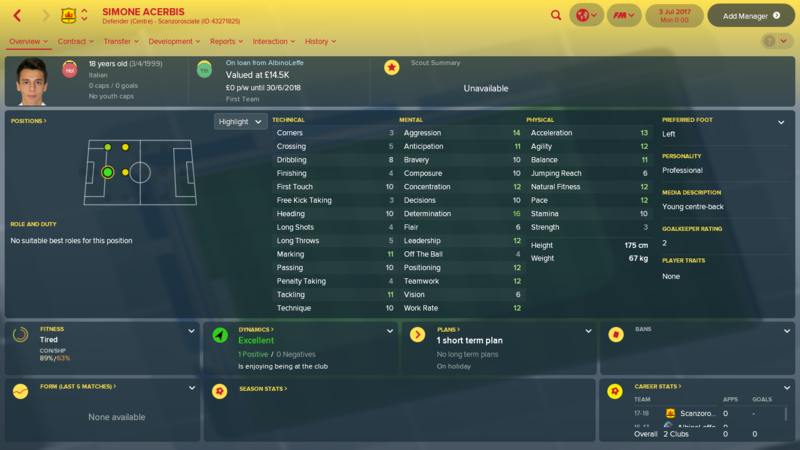 My transfer business, summer of 2020 - Vinicius looks like a steal!! The 4-2 against Roma was not as bad as it looked - we conceded early off a set piece, then had a soft penalty against us, and by the end of the match Danilo D'Ambrosio had been given such a chasing by Diego Perotti he may never play for me again, injuries permitting. Icardi scored both our goals, before heading to the changing room to make the call for 100 Argentine criminals to be despatched to the referee's house. EDIT: Sacked. In early December there were a bunch of teams on similar points (4th and 10th could switch over one weekend) and we were in 9th so I had to promise the board 10 points in 5 league games. 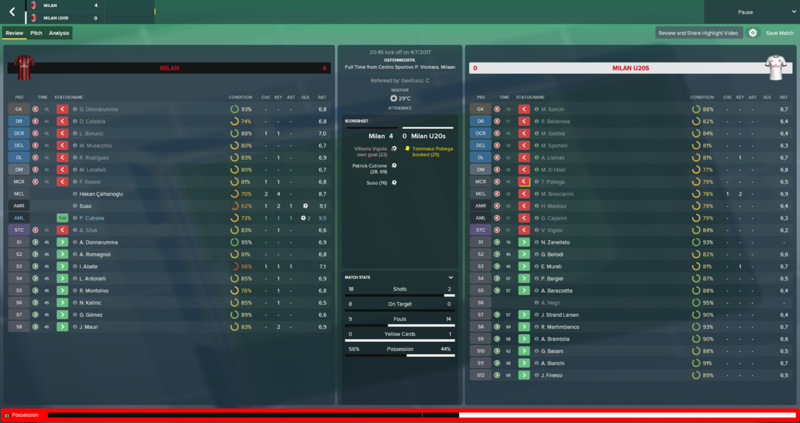 I got 8 - 2nd time round against Roma finished 0-0 and then Juventus got a lucky strike to beat us. Frustrating because we were creating so many chances, I've never seen someone of Icardi's quality so wasteful. Dumped Milan out of the cup between those league games though, which was fun. May just leave Inter until FM19 now, starting over a third time doesn't seem worth it. hey guys i'm newbie on this forum, just wondering how this kid develop on your save? i think he has decent ability except his height for lower league at the start. I decided to make a new carreer save with AC Milan. 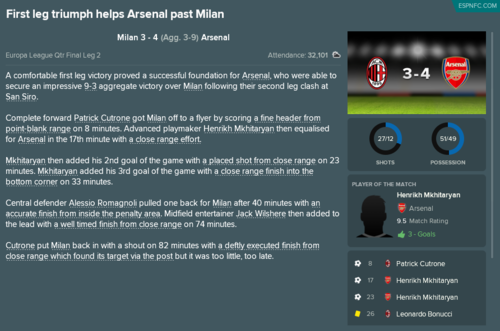 I'm far from an expert at FM nor any good at writing but I've decided to post some of my save for two reasons. First off, I never seem to be able to get past season 1 on FM18. Writing about it a bit will probably slow down my in-game speed and hopefully increase my connection to the carreer. Secondly, I hope to get some reaction on what I do and how I do it. Plenty of people around here who know more about the game than me, and who might want to share how they would do things differently. Some of the roles I have not yet tried are the Raumdeuter and the Trequartista. I thought it might be fun (rather than clever) to try to build my tactic around them. I'll be using a Trequartista in the striker position and a Raumdeuter on the left wing. My assumption is that the TQ will create the space and chances the Raum will use to score. Ideally I want the Raumdeuter to become my topscorer while the TQ ends up with most assists. Still not sure if I want the right wing as a Winger or an Inside Forward on support. Not wanting to overcomplicate things I'll only use three TI's: Play out of defence, Work ball into box and Prevent short GK distribution. As the Team Report shows I've got rather good players for all roles except for the TQ and the Raumdeuter, the two main positions I want to focus on. Rather than simply buying both (AC Milan pretty much spent most money prior to the start) I want to train Andre Silva into the TQ role and Patrick Crutone into the Raumdeuter role, as his report indicates he can be retrained to a left winger. In case this doesn't work out, he'll still have trained most of his striker attributes. 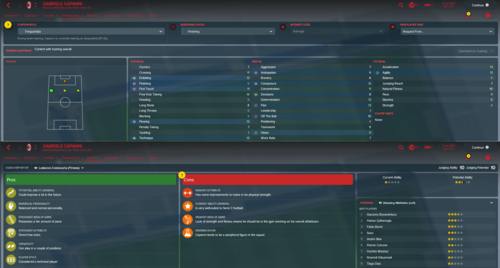 As for current future talent (Silva is only 21 and Crutone is at 19 years old) I have two possible candidates in the U20 to train the Raumdeuter and TQ roles. I'll be training Jacopo Finessi as a Raumdeuter on the right side. His Natural Fitness and Stamina are rather low at the moment so I have no idea how this will work out. Gabrielle Capanni on the other hand is a natural Inside Forward from the left side, yet his attributes seems to make me think he can become a future TQ. So I'll be turning a Striker into a Raumdeuter and an Inside Forward into a TQ highest up the pitch. So far so good. The only problem I have at the start of the season is the lack of decent tutors for both, so I might need to get myself some. As for youth I'll be releasing everyone below 3 stars and will try to find youngsters to fill the gap. Players 18+ that aren't good enough as back-up for my first squad will be loaned out, if anyone wants them. I loaded up Serie C too for the first time, hoping there's some lower league teams that want my rubbish players. I'll be selling Christian Zapata for about 7,5M and Jherson Vergara and Juan Mauri for some change which gives me some extra cash and extra wages to work with. Usually I work on getting Lautoro Martinez, but I dont' think he'll fit into this system. 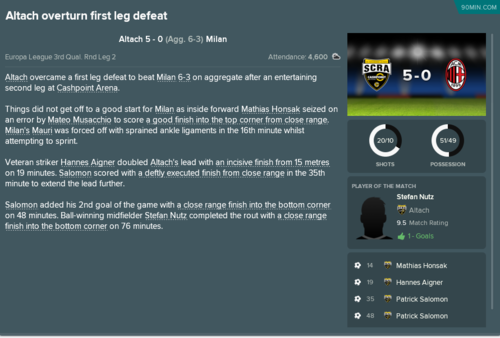 My first match was typically AC Milan vs AC Milan U20. Nothing fancy other than seeing the Raumdeuter score 2 out of 4 goals and the TQ (substituted Kalinic for Silva during halftime) not being involved in any action. Going to have to see how that works out in the next couple of matches. Hello, I'm writing from Italy. I red this discussion and it is very interesting. Anyhow, I noticed that people is mainly managing big teams like Juve and Roma. I want to propose a challenge I want to try. Lecce teams was a team from south of Italy, participating to Italian third division (series C) in 2017-2018. But in 1991, Lecce partecipated to Series A and in midfield one of the best player was Mazinho, a Brazilian football player. During his staying in Lecce, his son was born. My challenge is to manage Lecce back to series A and try to have Mazinho's son part of my team before end of his career. The name of Mazinho's son? Thiago Alcantara! P.s: Rafinha is the other son of Mazinho. Dream is to have both in Lecce! 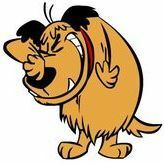 i had a £5m transfer budget and £180k spare in the wage budget, but now I have 0 transfer budget and -£192k wage budget. The plan is to get over Suso's loss by hoping Borini performs well when needed on either flank, and sell Montolivo. That should bring in at least £44.5m (of which I'd get £15,575,000) and remove £174,000 wage budget. Then I have to hope I don't have any long-term injuries as that would derail my season completely. Then hope the mysterious Chinese guys are good at getting sponsors, I guess? A unique challenge, which keeps things interesting, but given I set out with the aim of overhauling Madrid in CL titles...not great Bob! Are Milan's finances really badly fcked in the game? That's terrible that they just chop your wage budget like that! In my current save, I took over at managerless Fiorentina at the start of the second season having just won the Dutch league with Vitesse. They had somehow only finished 15th so sacked their manager, and i had always wanted to manage Chiesa and Simeone on FM. 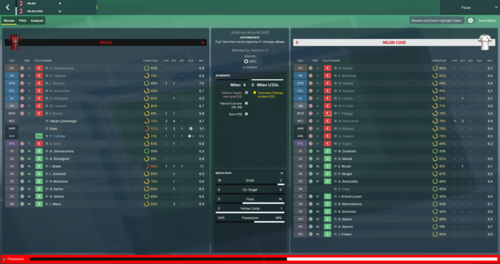 We just completed the season, and somehow lifted the Scudetto! 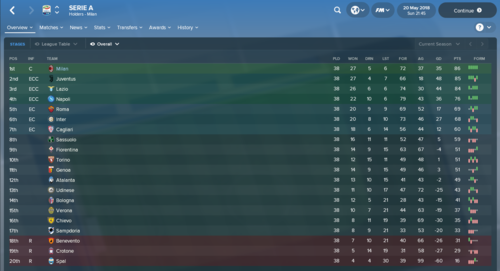 It was one of my most enjoyable seasons on FM so far. Simeone broke all sorts of records crossing 40 goals in the league alone! We had a scare towards the end when Juve put together a good winning run and we lost to Napoli and Torino in quick succession. However, Torino then returned the favour by beating Juve in the penultimate league game in their derby, while we won away at Frosinone to lift the title. Simeone's goal tally took him above Luca Toni as top scorer for Viola in a season of all time. Apart from him Chiesa, was fantastic with 18 goals and as many assists. His value has gone beyond 40m and he has United, City, Arsenal all sniffing around. Bennassi also has been immense in midfield. 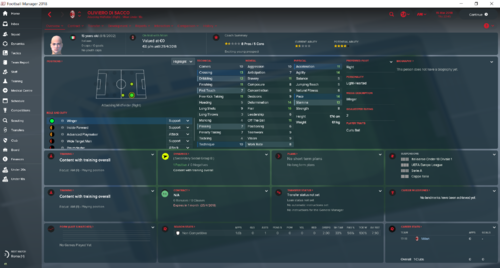 Simeone I almost lost to Liverpool in the Jan window due to his 30m release clause, but convinced him to sign a new deal at 55k a week while stalling the Pool offer. In terms of transfers in, we got Khouma Babacar back home from relegated Sassuolo, he fared quite well crossing 15 each for goals & assists. Other notable incomings were Marclos Llorente on a free from Madrid, who did very well as my DLP, Mauricio Lemos for 6m who eventually became a solid defensive partner for captain Pezzella, and Simone Lo Faso for 10m from Palermo, who really grew into his role on the right flank as time went on. In January we got Junior Taveres as our new LB but he is still settling in. And before I forget, the other immense performer at the club is Alban Lafont who is I think the best young keeper in the game. Turned down bids up to 25m from Dortmund for him. @karanhsingh it appears so! I do wonder if they're slightly less bad in the original database compared to 18.3, where the only difference in terms of playing personnel that I'm aware of is Jose Sosa's loan being bought out. I noticed when managing Midtjylland and Real Sociedad that the sale of Alexander Sorloth in the January window didn't affect the former's budgets, and when Carlos Vela's pre-arranged transfer went through I didn't get that money either. But then again he likely wouldn't have been bought out by Trabsonszpor as I find those deals almost never are in the game. That's a ridiculous season! What sort of a tactical setup were you using? If you had Lafont, is this one of those summer transfer update databases, or did you just buy him yourself? I got him for my Lyon team when I expected to lose Anthony Lopes, but now I just have to rotate them when I play that save and Lafont has played outstandingly against the top teams (I made him my CL and Cup goalkeeper). Been one of my must-buys the last two FMs. Also I just looked on my save more closely and Antonio Donnarumma, a Serie C quality keeper according to my coaches, is on £31k / week. I doubt I'll even be able to mutually terminate his contract given my lack of funds. 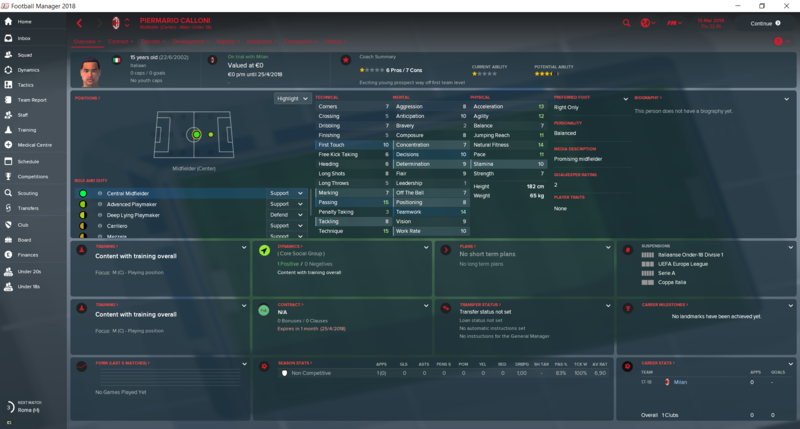 Marco Storari is on the same wage and I stupidly activated his extension despite him being 40 years old, but he's actually still better (even has better Agility) so not as bad. Thanks! 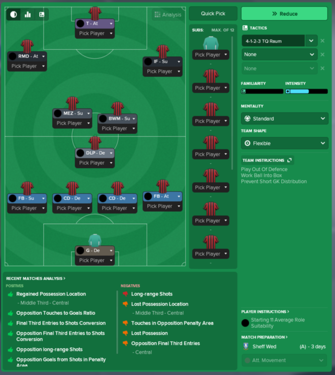 Using a 4-3-3 with a flat back four, a DLP in the DM position, two CMs with one BBM (Bennassi) and one AP (Saponara). Chiesa as an IF from the left, Lo Faso as an attacking winger on the right and finally Simeone as a CF up top. However a lot of the games I also dropped Lo Faso and played Khouma Babacar alongside Simeone as a DLF, making it slightly assymetrical. On another note, its quite cool how they refer to Babacar as "El Khouma" in the match engine, I wonder why that is. Now for next season, I already have Domenico Berardi coming in on a free transfer to add more competition for the attacking roles. I think mainly I am looking to sign a really high quality centre back to make us more solid defensively. Will probably sell Vitor Hugo who almost lost us the league title with a stupid red card. I have my eye on Caldara at Milan right now. Any other recommendations? Ah yeah, that one central one offset striker thing can work quite well. I never managed to get Chiesa working as an IF in my multiple attempts. His full name is Khouma El Hadj Babacar, and he has "El Khouma" on his shirt. I had Caldara on a two year loan with a buy option on one of my saves he was outstanding, would be a great signing. Who do you have as DLP? Locatelli can be great, as long as he hasn't picked up the wrong traits. If you need another winger, try raiding Palermo again for Felice D'Amico, he's a great prospect. 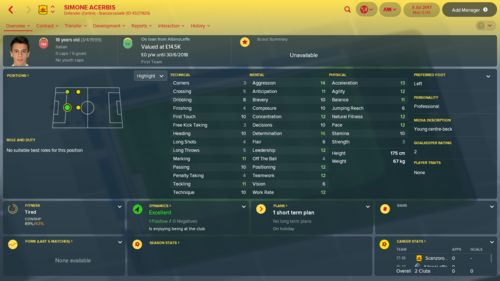 Very similar to Lo Faso in terms of traits and attributes, just slightly better and doesn't have that irritating "shoots from distance" trait. If a big club moves for one of Simeone or Babacar, look at either Pinamonti or Cutrone from the two Milan clubs. The former is more of an out-and-out goalscorer whereas Cutrone can be more well-rounded, but given you're using SImeone as a CF to great success I'd imagine Pinamonti would also do well. 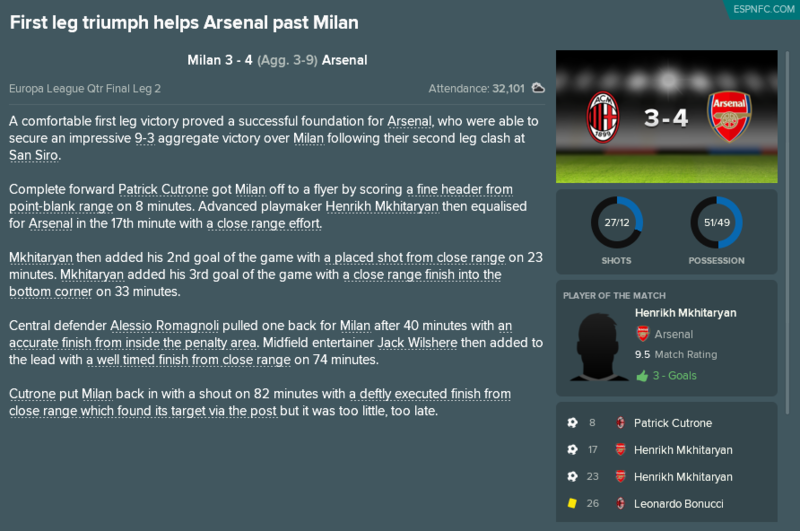 What tactic did you decide on for your Milan save? I'd love to hear how it's going. I restarted mine because of a corrupt save file. Still trying to make Treq in CF position work! @zlatanera thank you for the tips! I saw your message too late though. I had to pick between Caldara and Manolas for my big CB signing and I finally picked the latter. I did a close analysis of their attributes and Manolas’s physicals eventually convinced me to go wth him. If I can retain all my stars, that will be that. I will trim a couple of squad players. My DLP is Llorente from Madrid. Also D’Amico is already at inter on my game as I’m using an update. This should likely be my squad going into the new season. Ö-zil's Sacchi 4411, but I turned it into a 442. Initially with DLF-At, then TM-At (which worked well on my Manchester United save), now CF-At, instead of the AM-At. I'm £335k over wage budget as nobody came in for Suso, Montolivo refuses to leave or take a pay cut, the only one I got rid of was Antonio Donnarumma to Chelsea, which was a miracle as I wouldn't pay him more than £5k/week and he was on over £30k/week. Ah I was of the belief that D'Amico had returned to Palermo. Fabricio Oya was incredible on my River Plate save, technically excellent and with time his mentals will be outstanding too. Not the greatest physicality. Amazingly I haven't had Berardi on FM18 he's always a must-buy. Yeah Manolas is a beast, a huge like-for-like upgrade on Vitor Hugo. Eusebio Di Francesco (4-1 defeat by me in the EL 2nd knockout 1st leg was the final straw). Also, in my first youth intake I got Lorenzo Salvato, who "looks like he could possibly emerge as one of the best players of his generation". He's a centre back too, which is good as it feels wrong not having a homegrown star centre back at the club of Baresi, Maldini and Costacurta. Once Leonardo Bonucci is finished with Conti, Calabria, Barreca and Romagnoli he'll hopefully still have enough in the tank to turn this guy into a future captain! How did your season go by the way? Yes Manolas should be a good upgrade. Planning on keeping Vitor Hugo as back-up and selling Maresic who despite having good potential hasn't performed. Watford have bid 8m for him and I dont see him getting regular football with us. 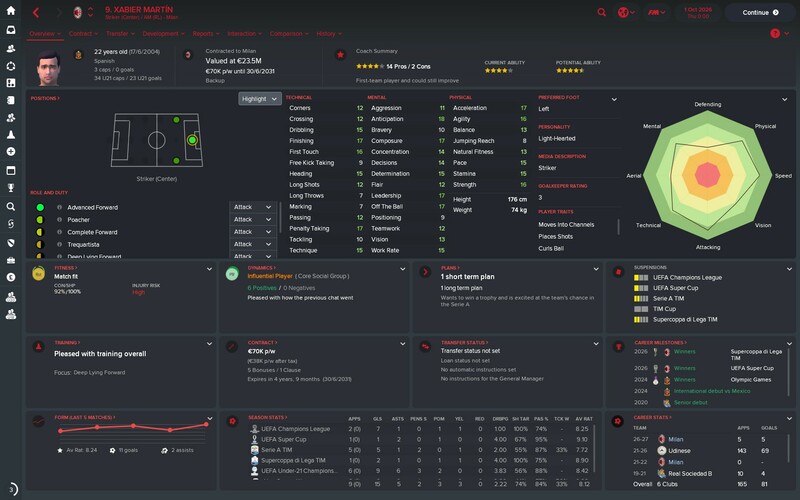 Re Fabricio Oya, he developed incredibly well on my last save and was playing first team for Spurs. So I have had my eye on him and finally managed to bring him in. He will be competing with Saponara for a first team spot, who was solid if unspectacular last season. Yeah he's a little low on jumping reach but then again Franco Baresi was only 5'9. The pace of their attack is so OP - I can kinda understand Mkhitaryan and Aubameyang being rated for their Dortmund form rather than what they showed the back half of 2017/18 but I don't get how Alex Iwobi is rated so well. 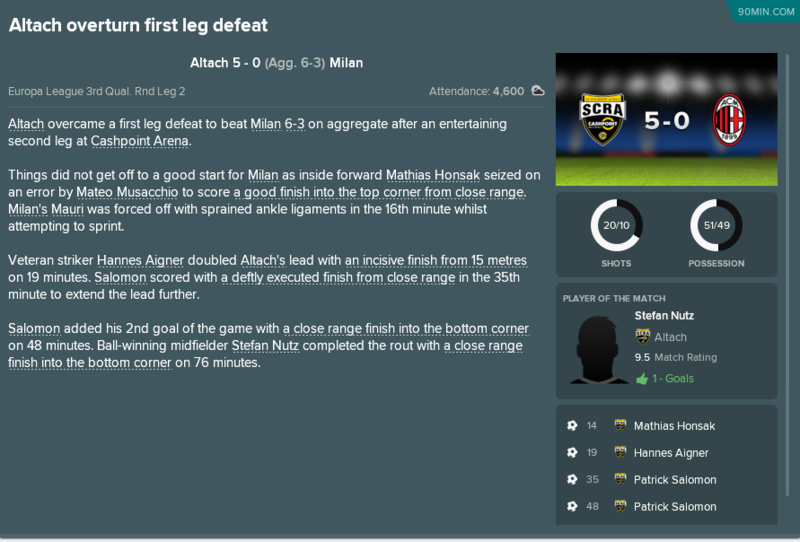 Losing Donnarumma when we were only 2-0 down in the first leg didn't help matters much, Storari is past it. I'm quite annoyed he's now in our records as our oldest ever player when before it was Costacurta, a bona fide club legend who actually scored on his final game. Yeah I've only ever managed to get much out of Saponara playing him behind two strikers in a 5212 formation. Even then he didn't rate highly in terms of assists - I liked Chiesa-Simeone as a strikeforce so Saponara would usually play it for one of them two to set up the other for a tap in. Our inability to keep a clean sheet is worrying, but may also be linked to Donnarumma not playing our last 8 league games - we kept 1 clean sheet in that time. 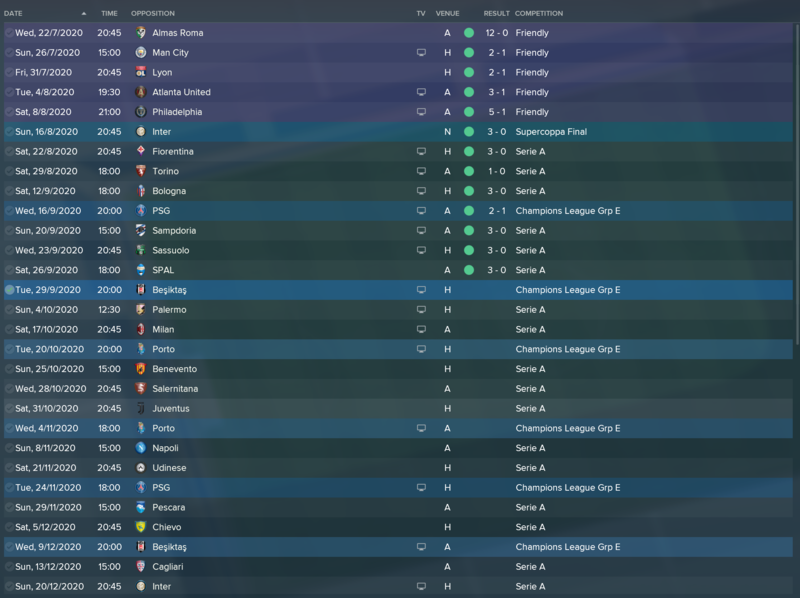 The season really took on when I stopped trying to replicate the AM-At role in the striker position and instead played Kalinic in his natural CF-At role. Our right backs changed all season long - Abate was first choice early in the season with Calabria rotating, then once he returned from injury Andrea Conti made the spot his own - so were never really in contention so its nice to see the 3 constants in my back 4 receive recognition. Going forward everything is up in the air - whilst I have a transfer budget, and more importantly removed Suso's release clause for the exact same terms, we're projected to fail FFP which would screw us long term as success in the CL is the best way to attract more sponsorship income. Ricardo Montolivo is refusing to leave as well which would remove £73k per week from the wage budget. I'm locked into at least 18 months more of Franck Kessié too, given he signs permanently in summer 2019 which is worrying as he's by far our worst-performing regular starter. His traits of Runs With Ball Often and Shoots From Distance are really bad for us given the former tends to lead to pointless long shots anyway. He took 108 shots this season - only Kalinic took more, and Andre Silva (18 goals) and Hakan Calhanoglu (12 goals, also free kick taker) were the only others who took over 100 shots - yet only got 4 goals in all competitions. @zlatanera that's very well done! Congratulations on the Scudetto. Tough luck against Arsenal, yes they along with Man Utd are very OP in the game. How do you plan to address the financial issue? Sell any players? Although I guess a good run in the CL should help. Re Kessie you could try to train him to stop taking long shots. That conversion rate is god awful! Also how's Cutrone getting along? Returned to Italy for the first time in years recently. Started with Fiorentina. They did have a lot of players that I wanted to shift but as a lot of them had recently joined it would be difficult. 1st summer I only made 1 signing which was Jefferson Lerma for 4m. Finished the season 6th, missing out on a 4th place finish by losing my last game of the season. Quite a few issues during the season though, Simone was not consistant enough but finished as our top goal scorer with 16 goals. Chiesa had multiple injuries throughout the season limiting him to 19 league appearances but still contributed a lot when he played, same issue with Sapanora. Sportiello - For 5.5m to make his loan permenant is not bad for a decent Italian keeper. Jacapo Sala - With Sampdoria relegated and I needed a new RB thought he was a bargain at 2m. 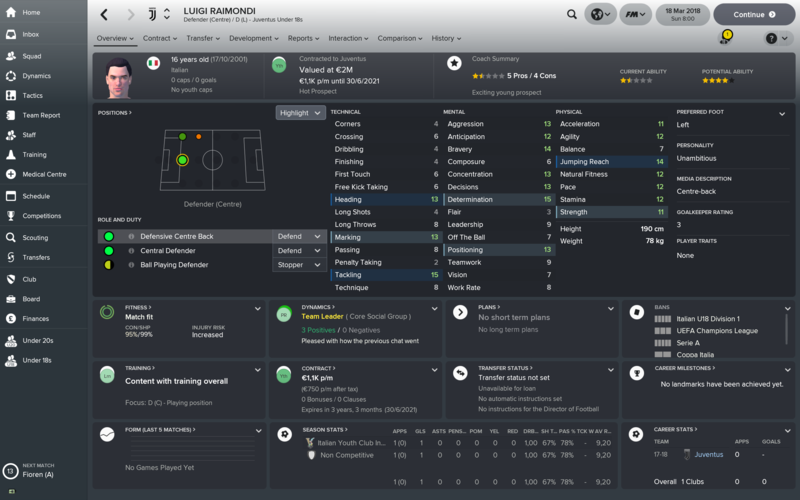 Lo Faso - Made permanent after his loan for 2.2m. Couldn't pass up as has massive potential. Had a good season for me also albeit a bit inconsistent at times. Norbeto Balaogh - Signed for 5.5m from Palermo. Looks like a good youngster that could become great. Outgoings so far are Baldelj (Wants a ridiculous new contract and with a year remaining I decided to cash in with 8m sale. ), Olivero (average left back just didn't like him), Christofo (don't rate him so wanted to get him off my books), Vertout (Same as Christofo). Losing 3 centre mids means I need to bolster my options there, limited with budget atm so hoping to find some bargains. Also Benessi is wanted by Arsenal so trying to keep hold of him will be a task. @karanhsingh Selling players was a key part of my strategy yes. I took in £207m in transfer fees to help sort us out so far. I've only got 35% of that as transfer budget which means the club has £134,550,000 in cash (although I did use installments to get the value up in some deals going both ways). We have £115,771,453 net debt apparently. Which you'll notice is less than what I've took in for the club. They're not willing to give me a greater percentage of transfer revenue, or any more money, they're not willing to upgrade facilities, junior coaching or youth recruitment, and won't even look for an overseas commercial partner. Oh, I knocked £500k / week off the wage budget too. I'm hoping at some point I'll get a message saying the good financial performance has allowed them to pay off their debts, as has sometimes happened at smaller clubs when I've had a big summer. One thing I'm proud of is getting in Federico Chiesa for £58m (£34m plus £27.5m over three years) to make him the most expensive Italian ever (beating Buffon) and our record purchase (apparently still Rui Costa irl), then when Arsenal inquired about Calhanoglu, who Chiesa would replace and who was upset because Manchester United didn't want to pay £60m for him, I got the exact same deal out of them. So I've effectively broken even on upgrading my right wing, although Calhanoglu's set pieces may be missed. r.e. Kessie I can't train him for some reason. I don't know why as I've always been able to train loan players before (including Saponara at Fiorentina who also had an arranged transfer) but I couldn't train Kalinic, Borini or Kessie last season, so now he's the only one. I've bought Lorenzo Pellegrini as a replacement who also has the long shots ppm but not the dribbling one (I find they're related in terms of dribbles leading to no passing options leading to a long shot) and has a better long shots stat, so I've downgraded Kessie to Backup status. Interestingly he's on £1k / week less when he joins, with slightly reduced appearance fee and unused sub fee as well. 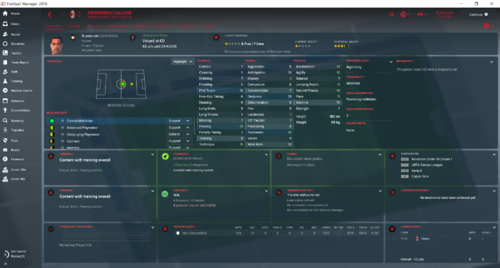 My only other signing that wasn't pre-arranged has been Nicola Leali for £850k from Juventus to backup Donnarumma so I could loan out Plizzari for further experience as Storari had decided to retire. Tempted to steal Benassi from Fiorentina and train him to cover CB as well as CM but I worry about not being able to give enough playing time. Cutrone is doing ok, he didn't get much league action last season especially once we were out of Europe and I didn't have to rotate. Still, he ended up with 19 starts and 5 sub appearances, 15 goals, 1 missed penalty, 3 assists and 2 PoM with an average rating of 7.24 overall. One interesting thing which perhaps chimes with something I saw in an earlier post about Serie A having a lot of fouling (or cards) is that in 12 Europa starts he drew 11 fouls yet in 6 starts 4 sub apps in the league he drew 19. 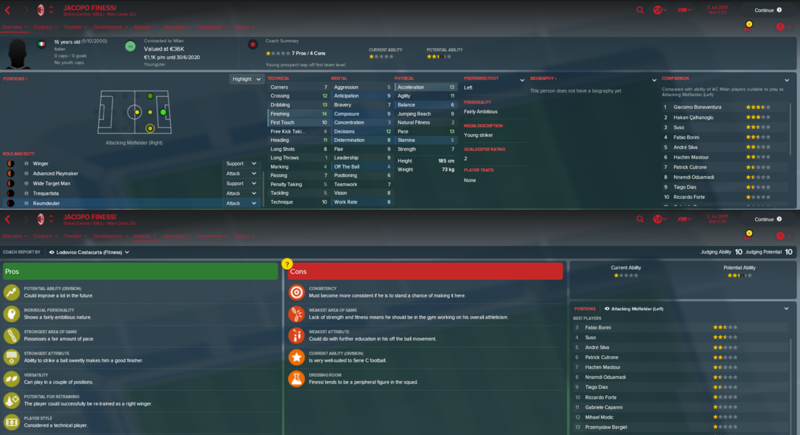 I would normally be tempted to promote him to first choice ahead of Andre Silva, but for my long term re-Italianisation project to work I need funds, so I need to boost Silva's value as much as possible by playing him. 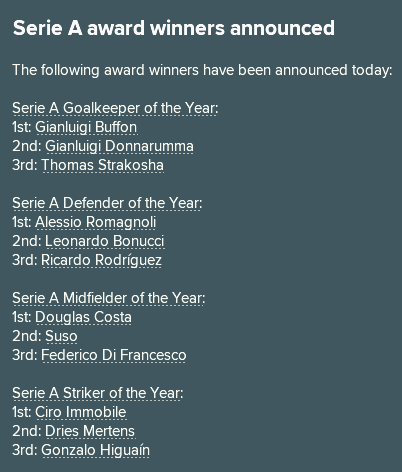 Also we got 3 out of 4 of the domestic u19 best player awards last season - goalkeeper (Donnarumma), midfielder (Locatelli) and forward (Cutrone). Donnarumma was the only eligible gk though, and young forwards didn't do well either. 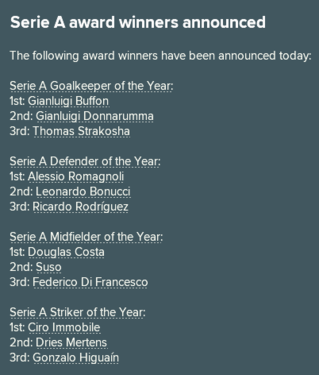 Midfielders were more competitive though, and I actually signed the runner up to Locatelli (Chiesa). 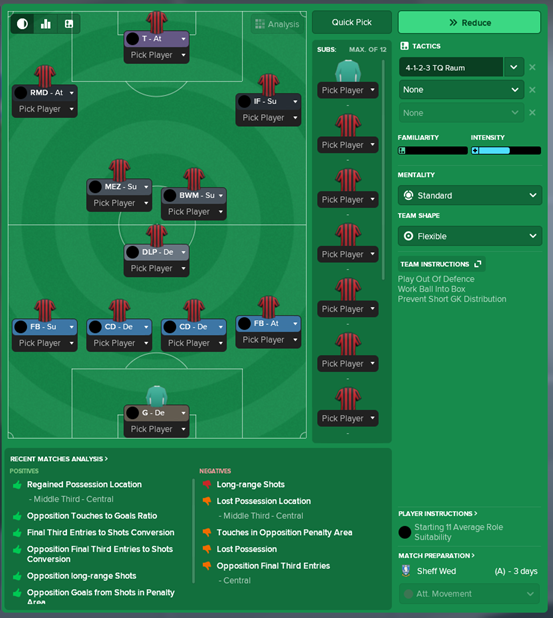 I've experimented with actually using the options for free kick routines this time for the first time since FM15, although I couldn't find many published set-ups. If they work out I'll share them. @karanhsingh Selling players was a key part of my strategy yes. I took in £207m in transfer fees to help sort us out so far. I'm not doing that well in the league, 5th place at the moment and it doesn't look like I'll catch Sassuolo anymore. I'm still in the league for Uefa League and I'm playing the Cup Final, but I do hope I'll be playing CL next season! I've got some good youth intake this year, so I'm looking forward to the next seasons! If anyone has any players with good long throws and is willing to train the "long flat throw" trait, this routine by Keysi Rensie is working well for me. I've got a quick throw routine on the right where Conti and Calabria aren't great at it, but on the left Ricardo Rodriguez (16 long throws) and Antonio Barreca (14 long throws) meant I looked for something to take advantage. The game doesn't track these things but I reckon I've had at least 4 assists from the long throw in 16 games so far. The most recent was particularly great to watch - Barreca with probably his first touch of the game threw the ball beyond the far post for Kalinic to chase, turn and finish. 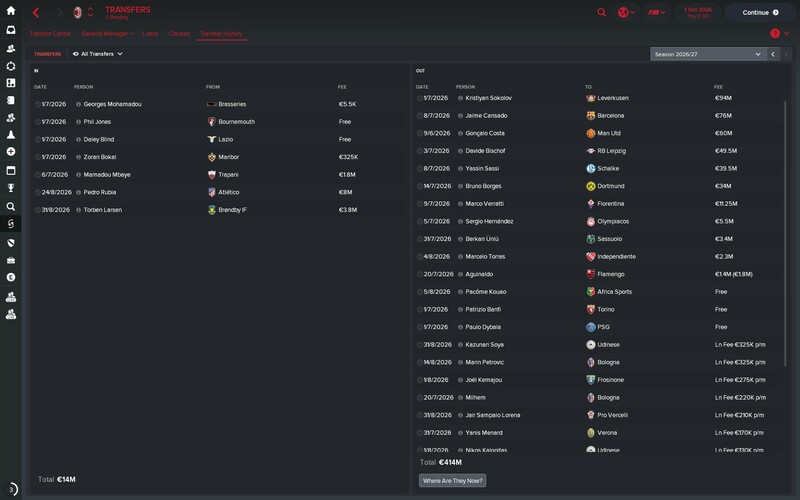 I also didnt realise that with my new signings, we went to 875k a week on the wage bill, with a budget at 675k! However the Board then asked me to sign a new contract and I demanded a much higher wage budget, which they agreed and increased it to 850k. Phew! It is a lot higher than last year but with us playing Champions League football hopefully we can afford it. Bringing down the bill a bit by moving on Vitor Hugo, Olivera, and a couple fringe players. Almost ready to hit the new season! However, Bennassi is currently unsettled as he wants a new deal, and he is stuck on 100k a week demand (from his current 22k - ridiculous!). I find new contract negotiations very frustrating, the demands of some players when they are doing well are just ridiculous. Sometimes you just have to accept you're going to have to offer a massive wage rise - but only once they only have two years left on their deal. 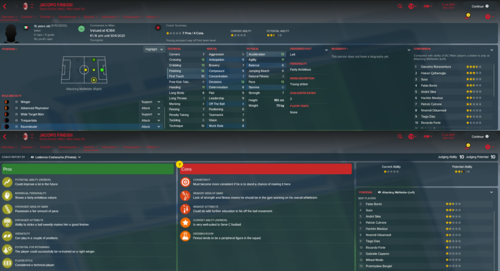 For example, Locatelli was going to move from Hot Prospect to Rotation - board suggested a limit of £73k, agent wanted £80k plus 10% wage rise and a couple of international appearance wage rises. Removed them, put contract down to £73k and added a year - instantly onto the yellow/orange "last negotiation" thing but he'd added a ton of clauses. This is a guy who's apparently "patient...prefers happiness over monetary gain". In the month it took to get him to the negotiating table again Locatelli averaged over 8.1 so the demands went up to Key Player, now he's on £120k / week. But with the extension clause I got in he's on it for 8 years I think Benassi is contracted to 2021/22 though so I'd give it 6 months see if he shuts up and hope his form isn't affected. £22k / week is very good for a player of his quality though. It was always going to happen! He's scored against his former club! We're struggling for clean sheets at the moment and I get this message in pretty much every game. Its slightly less frequent if you're not one of the Milan clubs with their chaotic recruitment over the past decade, but its still far more common than in other leagues. I've already had to give big pay rises to Simeone, Chiesa, Lafont, even though they all had 4+ years left to run because they wouldnt stop complaining. But I guess they are my 3 top youngsters at the club. 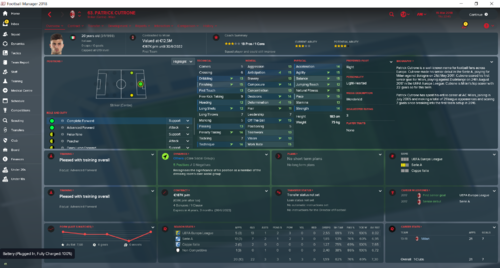 In fact, Simeone I had to give another new deal just 6 months down the line to increase his release clause! What is your suggestion for the thread?